This training program has been approved for 7 hours of continuing education for nurses by the Washington State University College of Nursing. When you have completed the course, the following source of approval will appear on your certificate: CEARP #9388. The course also includes 1 hour of content on how to prevent veteran suicide. QPR Gatekeeper Training for Suicide Prevention is the most researched, tested, and evaluated universal suicide intervention program available today. Taught to more than 2.5 million people by 15,000 instructors since 1998, the intervention has been adapted for a wide variety of settings. Supported by dozens of published studies, which include random clinical trials - the gold standard for evidence of effectiveness - please see the official listing and description at: http://www.nrepp.samhsa.gov/ViewIntervention.aspx?id=299 or just Google "QPR NREPP." Note: this is not a train-the-trainer program. The QPR for Nurses program is intended to prevent suicide not just among patients, but among nurses, their co-workers and family members. To earn this certificate requires a minimum of 7 hours of training and passing a national clinical and content exam. Suicide rates for QPR courses are US-specific. To determine suicide rates in your country, please visit the World Health Organization or Google your country's name and "suicide rate." Some countries do not keep good data on suicide morbidity and mortality, and not all report their data to WHO. Therefore, try Googling federal, state, or province name and "suicide rate." Remember that suicide rates need 5 to 10 year horizons to be of much value as to interpreting any changes in trend lines. The QPR Institute worked with a number of nursing organizations to tailor this training to the needs of learners. With the assistance of the Colorado Emergency Nurses Association, specific attention was paid to the needs of nurses working in Emergency Departments. Later refinements were offered by faculty members of the Washington State University College of Nursing Education. Nurses have a high degree of line-of-duty exposure to suicidal behaviors, both in the pre-attempt phase (when suicidal persons are communicating intent and desire to attempt suicide via suicide warning signs), and after a suicide attempt or completion. As health care professionals, nurses also have higher-than-expected exposures to secondary trauma resulting from suicidal behaviors, particularly in the ED. While perceived comfort and competence in conducting suicide interventions or dealing with suicide events varies considerably, many nurses have not had specific suicide prevention training that would be beneficial to the health and safety of fellow employees or suicidal patients. The final exam is a national 25-item test that few health care or mental health professionals can pass without completing this course or one like it. 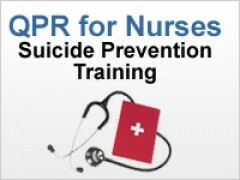 In past studies, and before specific training in suicide prevention, nurses fail this national exam at roughly 95%. Provide low-cost, evidence-based suicide prevention training. Provide advanced clinical training to a wide range of professionals and for undergraduate, graduate and post-graduate students preparing for careers in the helping professions. As of this writing in 2017, more than 2.5 million people have been trained in QPR. If this sounds like an "army" of people helping to prevent suicide, it is. Now, with your help, we will create a new division in that army of educated, trained nursing professionals to help prevent suicide around the globe. While expert opinion may differ as to what helper competencies are required to assist suicidal persons achieve the most beneficial outcomes, little controversy exists about the lack of qualified manpower to help the thousands of people who think about, attempt, and sometimes die by suicide. The history and source of these training programs is derived from earlier research and development work in partnership with Washington State University, The Washington Institute for Mental Health Research, the Washington State Youth Suicide Prevention Program, Spokane Mental Health (now Frontier Behavioral Health), and Spokane County Regional Health District. Much of the content of this training program was evaluated and refined by the author as a guest lecturer at a school of nursing education. We know that nurses are in frequent contact with at-risk populations and need to know as much about suicidal behaviors and how to intervene to reduce risk and enhance safety as do trained mental health professionals. To this end, the online program you are about to take is intended to train you in the knowledge and skills you will need to provide competent services in suicide risk detection, initial assessment, and how to immediately mitigate the risk of a suicide attempt. Consider that according a May 2012 article in Psychiatric Times that ... "of the more than 35,000 or more suicides per year in the United States, about 1800 (6%) are inpatient suicides. It is estimated that a psychiatric nurse will experience a completed suicide every 2½ years on average.” Source: J. Knoll,”Inpatient Suicide: Identifying Vulnerability in the Hospital Setting,” Psychiatric Times, May 22, 2012. As you will learn in this course, exposure to suicidal patients "goes with the territory" of the nursing profession whether you are a psychiatric nurse practitioner or working in a school or health clinic setting. This training is not a substitute for a college degree in counseling or other helping profession, nor can it provide the face-to-face supervised experience those in the helping professions are provided in the course of their professional career development. Modularized in a rich mix of text, video, voice-over PowerPoint™ lectures, interactive practice sessions, and other state-of-the-art interactive and e-learning technologies, the QPR for Nurses training program provides two certificates, one for completing the Level I QPR Gatekeeper Training for Suicide Prevention requires, and the second QPR for Nurses Certificate in Suicide Prevention. Passing the national exam demonstrates that the learner has acquired more knowledge about suicide and its prevention than a large majority of mental health professionals. Describe how and why "suicide proofing" an inpatient room and ward may prevent adverse events.